Clouds provide us clues about what is going on in the atmosphere and the approaching weather. One of these informative and helpful clouds is hot tower clouds. What kind of weather condition does this cloud type bring? How does it form? What role does it play in the development of a weather phenomenon? Read further to learn more. 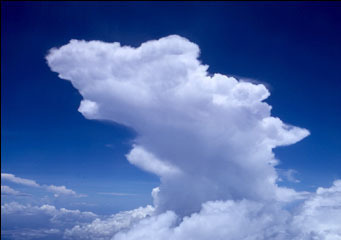 Hot tower clouds refer to towering cumulonimbus clouds whose summit reaches up to the top of troposphere and into the lowest part of the stratosphere. These clouds contain a significant amount of latent heat that causes them to rise further up. Hot tower clouds bring undiluted, warm and humid air from the surface of the ocean to the atmosphere and play a vital role in intensifying tropical depression into powerful hurricanes or typhoons. With the aid of the Tropical Rainfall Measuring Mission (TRMM) satellite, scientists and weather forecasters can determine the intensity of hurricane by looking into hot tower clouds. How are Hot Tower Clouds Formed? Hot tower clouds form due to the release of latent heat from the water vapor as it condenses and turns into liquid and eventually freezes into ice. The huge amount of energy or the latent heat causes the heated air to rapidly rise into the upper part of troposphere. It occurs as the heat released by water vapor warms the cool air in the tropopause (the region separating troposphere and stratosphere) triggering more condensation which likewise release more heat. These clouds occur when tropical cyclone or hurricane is strengthening. At What Height is Hot Tower Clouds Found? Hot tower clouds are found above the tropopause. The height of tropopause differs on the location and the season. In tropical regions, the tropopause is found anywhere between 16km and 18km above the ocean’s surface and around 13km in mid-latitude regions. In polar regions like Siberia and Antarctica, the tropopause is found 8km above sea level. What do Hot Tower Clouds Look Like? Hot tower clouds appear like heightened or sharp cumulonimbus clouds around the center of a hurricane. These fiercely tall clouds can produce extremely heavy rainfall and are responsible for making hurricanes stronger at a very short period of time. How common are Hot Tower Clouds? Hot tower clouds are common worldwide during tropical cyclone or hurricane season. In the Atlantic, the hurricane season is from June to November, while the Eastern Pacific will have it from May to November. As you can see, tropical cyclone or hurricane (in Atlantic) or typhoon (in Pacific) occurs at the latter part of summertime. This is because the difference in temperature between the sea surface and upper atmosphere is at its peak. Indeed, hot tower clouds are important clues that scientists and weather forecasters look for to determine the severity of hurricanes.